The Byzantine Empire, also called the Eastern Roman Empire, was a continuation of the great Roman Empire that gradually fell apart in the 5th century AD. The Eastern Empire remained continued on for a thousand years until in fell to the Ottoman Turks in 1453. The early Byzantine coins continued using the head of Emperor on the obverse side, but in full-face rather than in profile. The reverse usually depicted some sort of Christian symbol. 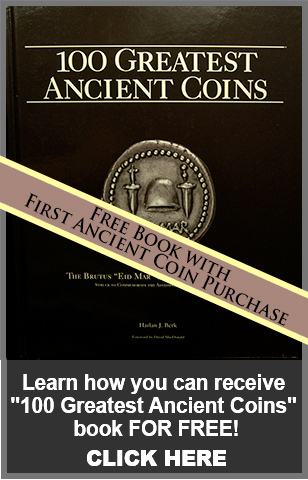 The type of coins minted during the Eastern Roman Empire were mainly gold solidus' and bronze coins. 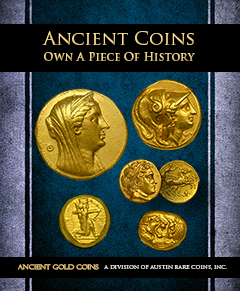 As time went on, the coins became thinner and wider, which eventually led to late Byzantine gold coins becoming so thin that they could be bent by hand.